P. Calpurnius was one of the moneyers for the year 133 BC. According to Crawford, he is perhaps the father of P. Calpurnius Lanarius, Legatus in 81 BC. Gens Calpurnia was a plebeian family at Rome, which first appears in history during the third century BC. The first of the gens to obtain the consulship was Gaius Calpurnius Piso in 180 BC, but from this time their consulships were very frequent, and the family of the Pisones became one of the most illustrious in the Roman state. Two important pieces of Republican legislation, the lex Calpurnia of 149 BC and lex Acilia Calpurnia of 67 BC were passed by members of the gens. 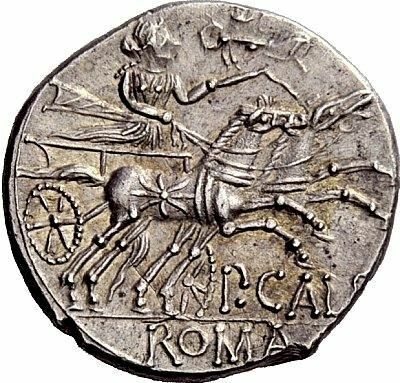 The Calpurnii claimed descent from Calpus, the son of Numa Pompilius, the second King of Rome, and accordingly we find the head of Numa on some of the coins of this gens.